Switzerland’s Nino Schurter won his first world championship when he was 18. Now, at 29, he has six such medals. With three of those world championships among the Elite Men (the toughest division of all), and three more world championships as a younger rider, Nino Schurter is almost in a class by himself. All-around rider: Nino probably has the best descending skills of any racer on the cross-country circuit, but he is also an unbelievable climber. Nino has been impressing other top riders for years. Nino’s team manager, the legendary Thomas Frischknecht, a former UCI world champion and World Cup champion himself, told us that Nino is the best rider in the history of mountain biking. That’s high praise from the rider who was arguably the top man on the World Cup circuit in the 1990s—and John Tomac’s toughest rival. As a Junior, Nino raced both cross-country and downhill on the Swiss national team before concentrating on cross-country. Nino was only 22 when he went to the 2008 Beijing Olympics and won the bronze medal. Three years later, while preparing for the London Olympics, Nino switched to 27.5-inch wheels and helped launch a revolution that soon swept the world. Power and skill: Nino Schurter (shown here at Bonelli Park, the weekend before the Sea Otter) has won three Elite Men’s World Championship titles so far. Nino dominated the 2012 World Cup series, then headed to the Olympics in London, but only took the silver medal. Nino’s most recent Olympic result may be the reason he is still part of our sport. 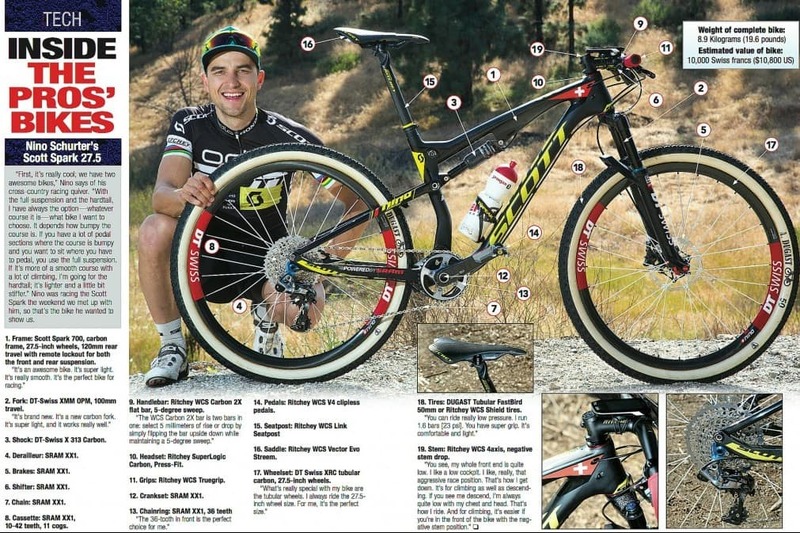 After racing road bikes early last year, Nino made it clear that’s he’s thinking about changing disciplines, but he said he plans to race mountain bikes through the 2016 Olympics. Whether he finally wins that elusive gold medal or not, one thing is certain. His place in mountain bike history is already secure.